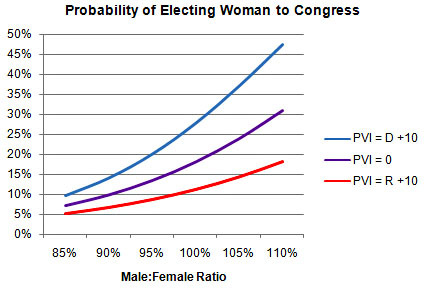 Nate Silver informs us today that although there aren’t very many women in Congress, the women we do have are more likely to come from male-dominated congressional districts. The effect is most pronounced in strongly Democratic districts (blue line), but it’s there in Republican and neutral districts too. Why? Who knows. It seems unlikely that a fairly small difference in male:female population ratio would actually be noticeable by the residents of a district, but Nate says the effect is pretty robust. In other words, it’s probably not a fluke. So what’s the answer? Some underlying variable that drives both things? Are women less likely to vote for a woman than men are? (Maybe some kind of analysis of exit poll results would help here.) Leave your guesses suggestions for further research in comments.